The icy comet Elenin made its closest pass by the sun this month, but it may have come out of the event worse for wear, according to an Australian astronomer. 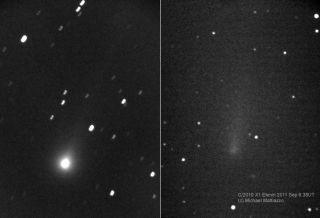 Images and video of comet Elenin recorded by amateur astronomer Michael Mattiazzo in Castlemaine, Australia, appears to show the object losing some cohesion in late August and early September as it neared its closest approach to the sun — a point in its orbit called "perihelion," — on Sept. 10. "I had suspicions about this comet since discovery in December 2010 that it would not survive its perihelion passage," Mattiazzo told SPACE.com in an email. "C/2010 X1 Elenin is an intrinsically faint (small) comet making its first passage through the inner solar system. These 'non-periodic' comets tend to perform below expectations as opposed to reliable and predictable periodic comets such as 1P Halley." The famed comet Halley, better known as Halley's Comet, makes a pass through the inner solar system once every 76 years. NASA officials at the Jet Propulsion Laboratory in Pasadena, Calif., told SPACE.com that the space agency is waiting for Elenin to re-emerge from its perihelion pass near the sun before making new observations. The space agency's Solar and Heliospheric Observatory (SOHO) may be able to observe the comet between Sept. 23 and 29. Comet Elenin is expected to pass nearest to Earth on Oct. 16, when it will be about 22 million miles (35 million kilometers) from our planet. The comet is between 2 and 3 miles (3 to 5 kilometers) wide. Mattiazzo said that he is no stranger to seeing comets fizzle as they near the sun. "I witnessed the spectacular demise of C/1999 S4 LINEAR in July 2000, when it appeared as an elongated cigar shaped smudge through binoculars," Mattiazzo said. "This time around, C/2010 X1 Elenin is more difficult to observe since it is located very low in the western evening sky and only then, observable from the Southern Hemisphere. Let's hope that northerners have something to see by the time it reappears in October morning skies. Perhaps a very faint, long, diffuse smudge." NASA astronomers have used some space telescopes to observe comet Elenin's pass through the inner solar system. Last month, the space agency's Stereo sun-watching spacecraft spotted the icy comet. Comet Elenin has gained an Internet following largely due to apocalyptic rumors that claim the comet will align with other planets and wreak havoc. Another doomsday scenario claims that Elenin is not a comet at all, but in fact a rogue planet called Nibiru that will also bring about the end times on Earth. NASA has dismissed all claims that comet Elenin is anything more than just a dim comet. "Any approximate alignments of comet Elenin with other celestial bodies are meaningless, and the comet will not encounter any dark bodies that could perturb its orbit, nor will it influence us in any way here on Earth," Don Yeomans, a scientist at JPL, said in a statement last month.